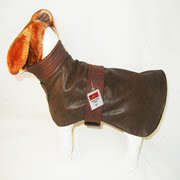 This jacket is made out of pure leather with brown cotton lining. You deserve to treat yourself to this luxury soft leather jacket. Please let us know if you want to use the jacket with the harness so that we can make a whole at the back of the jacket for ease of use. Remember if you cannot find your size here, you can always send us your measurement so that we can make the jacket exactly your size. "This item is sold out but if you are interested please send us an email on info@minidach.com before placing your order to make sure that we have the leather in our workshop".